Creating mailing groups in Gmail can be a slightly tedious task. Most of us need to make email groups for our classes or for ECA's or for our volunteers, or group projects...you get the idea. I think we all know how to create our groups through "Contacts", but here is a more efficient way that I think you'll find useful. You can actually create the group directly from your Gmail message. Take a look. 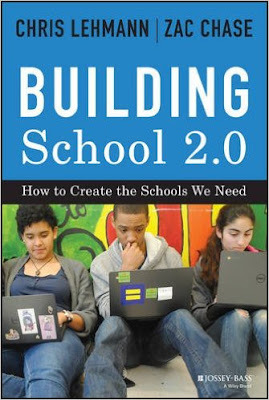 How to Create the Schools We Need? At our opening PD in August, I spoke a little bit about a book a friend of mine wrote with his colleague. Zac Chase and Chris Lehmann have produced an inspirational guide to building (and sustaining) schools we need in the 21st century. Chris Lehmann, widely recognized as an ed-tech leader and educational reformer was named "Outstanding Leader of the Year" by ISTE in 2013 and was the recipient of the prestigious "Rising Star" McGraw prize in education, the very next year. His work as principal and founder of Science Leadership Academy (regarded as one of the 10 most amazing schools in the U.S.) has earned him many honours and awards, including being considered one of the 30 most influential people in ed-tech. Zach Chase is a gifted educator with whom I had the joy of working a few year ago. Zac travels around the world consulting with teachers on the "thoughtful combination of pedagogy and technology for teaching and learning". He currently is a National Fellow at the Institute for Democratic Education in America. I loved this book and wholeheartedly encourage you to read it. Each chapter ends with a section "From Theory to Practice" giving solid examples of classroom or personal applications of the chapter's topic. This is not a book about technology, but rather it is a broader discussion about education and how we can create learning spaces (...and yes, infused with technology) to teach our children to be problem solvers, life-long learners, and thoughtful citizens. "The purpose of school is not to train children but to teach them, and that requires the human element. If anything, we need more adults in school, not fewer." 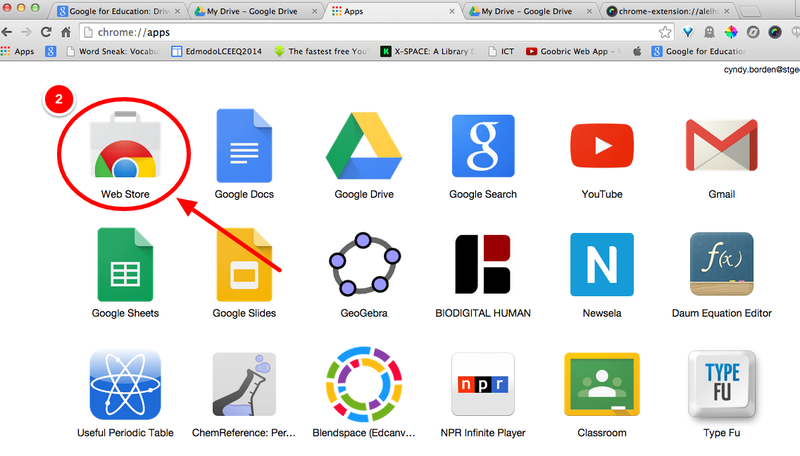 What is Google Drive and what is it good for? Well many of you may remember when Google Drive was simply called Google Docs, which was a bit of a misnomer, because it is so much more than just docs. 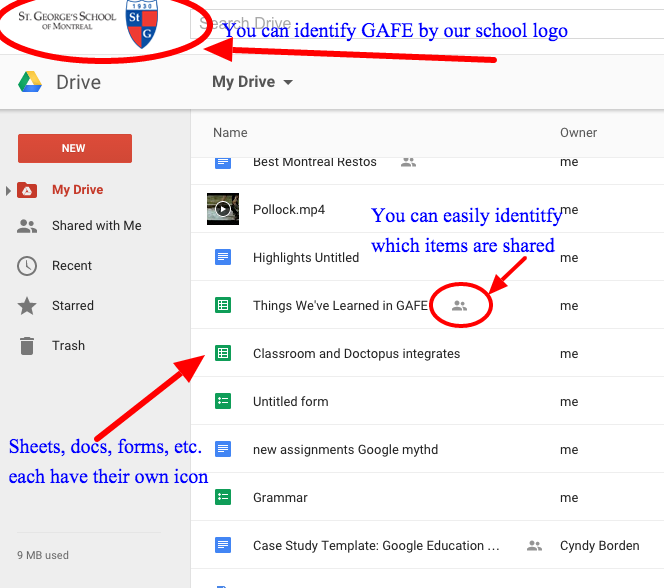 Google drive can store and sync your files (with GAFE we have unlimited storage), but it is also where you can create a doc, spreadsheet, slideshow, survey (Google form), or drawing. The collaborative nature of these tools is why we would choose to create our documents or projects here. 2. Google Drive on your computer looks a little different. First it needs to be installed locally. 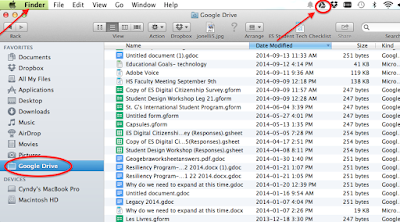 Find Google Drive in Launchpad and double-click on the icon. Follow the instructions to install. 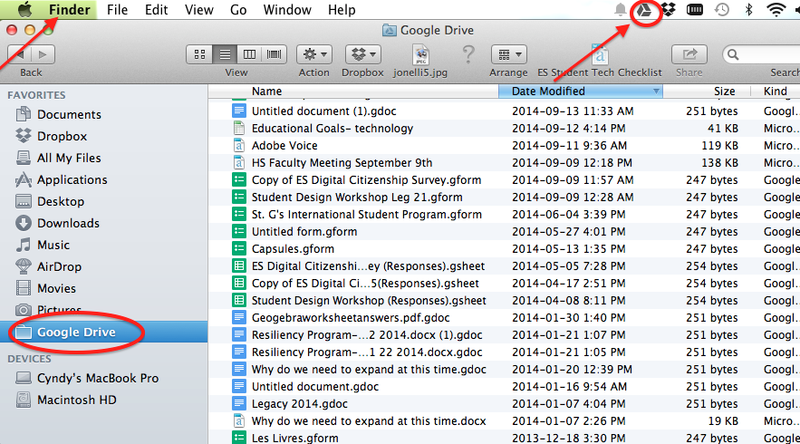 You will notice a new folder will appear in your Finder window, called Google Drive and looks just like your Documents folder. Files placed here are saved on your hard drive. You will also notice a small icon up on your menu bar, at the top of your computer, if you are on a Mac (or at the lower right of your screen, on the taskbar, if you are on a PC). This small icon will pulse when you are syncing files. 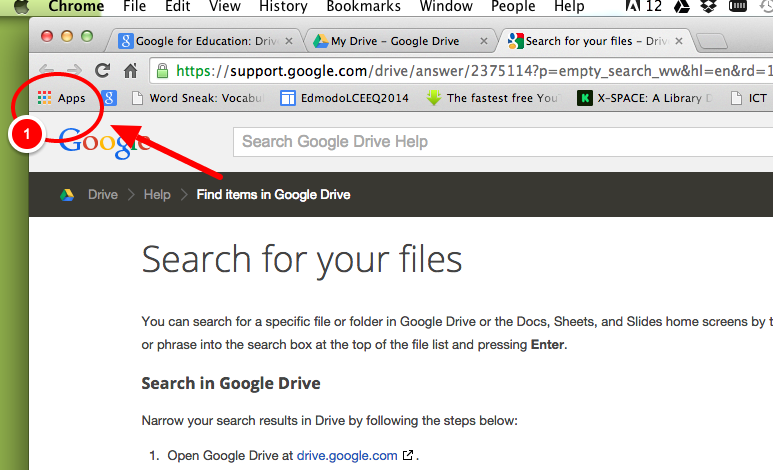 This means, when you save a file to your Google Drive on your computer, it will mirror it or sync with your Google Drive on the web. In this way, Google is backing up your files. If something happens to your computer, you can retrieve all your data from Google Drive on the web. It also means, when you don't have your computer with you, you can also access your files on the web. All three platforms work together, to make sure your data is available to you when you need it. 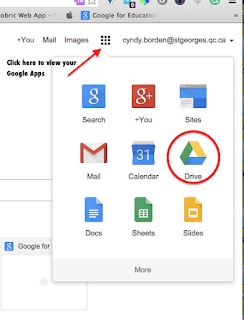 From any of the Google Drives you can share files with colleagues or students. 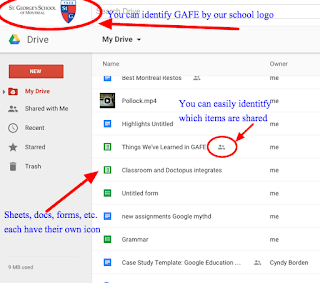 All files, MS Office, PDF's, images, video, --- can be saved in Google Drive, but there are also highly collaborative tools, like Google Docs, Sheets, and Slides, which can be created directly in your Drive on the web. These tools allow for as many as 50 collaborators at a time. As the owner of the document (or sheet, or presentation) you decide who can edit and who can only view. All changes to the document are saved automatically, and a Revision History is available if you need to revert back to an earlier version, or to simply monitor who has added what. So, Google Drive is the place to house all your files, Google or otherwise. If you have always backed up your data on an external drive, please continue to do so. It is always a good idea to back up in two places. Browsing history, settings, and data, such as bookmarks, apps, extensions, themes are saved to your Google account and can be recovered if your computer is lost or broken. Simply signing into Chrome again will bring them back. Changes you make on one computer are automatically and instantaneously reflected on the other computers where you are signed in and have enabled sync. You can also sync open tabs, bookmarks, and omnibox data from your computer to your phone or tablet with a Google account. Accessing previous searches and settings across devices can help both teachers and students save valuable time. Chrome has the ability to extend its functionality through apps and extensions. 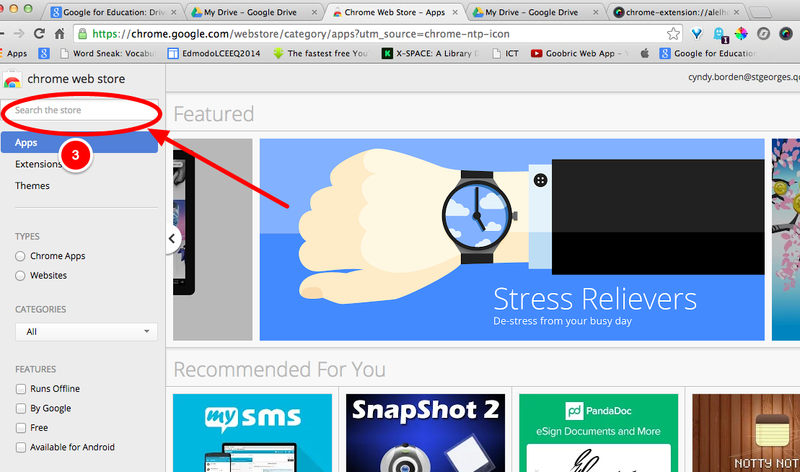 Click on the "hotdogs" (hey, I don't name 'em) in the upper right corner of Chrome. Here you will find your bookmarks (and where to import and export them), your history, your recent tabs, as well as tabs open on your other devices. Under "Settings" you can customize the appearance, such as font size and style themes, and can personalize your search experience. 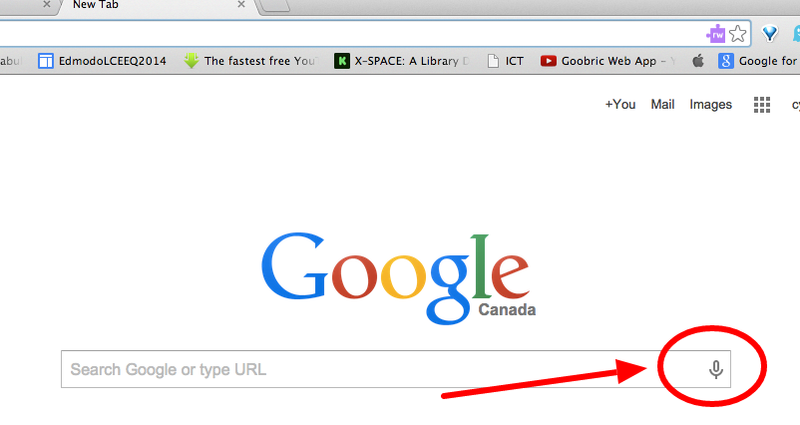 This is also where you sign in to Chrome if you have not already done so. Further down the menu is "Help". Help > Help Center is a great place to get you started, where you can review the basics, learn how to personalize Chrome, find tips for searching the web, and more. The green rectangle below is called the "omnibox", it's the familiar place where we type our URL's and where many of us begin our searches. Typing key words here will produce popular search suggestions and auto-complete recently bookmarked sites, but did you know you can do math calculations in the omnibox, or convert currency and measurements? By typing in specific words like Define:, or Filetype: you can filter your searches. Use the omnibox as a dictionary. You can also use the omnibox to track a package, or check the status of a flight, set a timer, find a sport score. 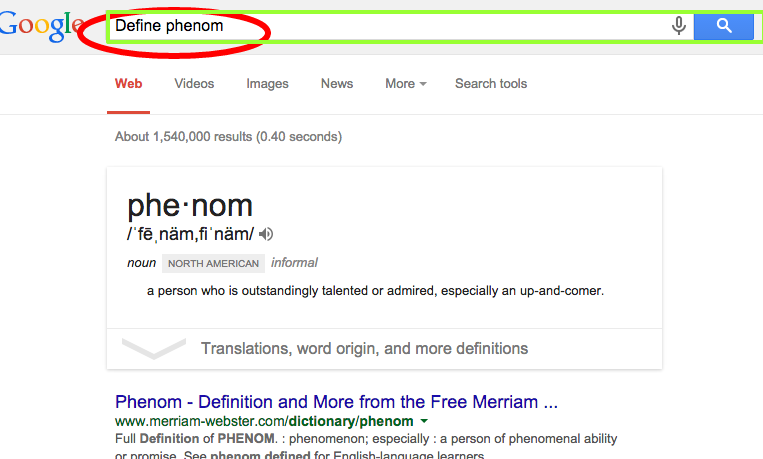 Click here to see more Google search tips and tricks. 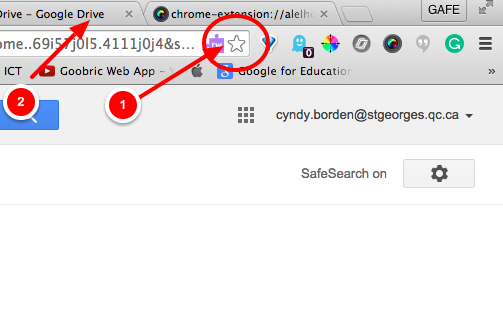 You can quickly add websites to your favourites by clicking on the star shown in figure 1 below. We can add apps and extensions to Chrome. Think of apps as web-based software. To access the Webstore click on the apps button on the right of your browser. Then Click on the Webstore icon. The other icons you see below are app I have added. There are a daunting amount of apps available. You can filter your searches to be only apps produced by Google, and that might be a good place to start. They are also divided into categories, and there is one for Education. As you can see in the figure below a description and reviews are available, but feel free to try out different apps to see which work for you. There are some apps that work offline. The Webstore is also where you will find Extensions. These work directly in Chrome to enhance its capabilities. Here you can see some extensions I've added. An example would be a Youtube ad blocker extension, which will block ads when you play a Youtube video. 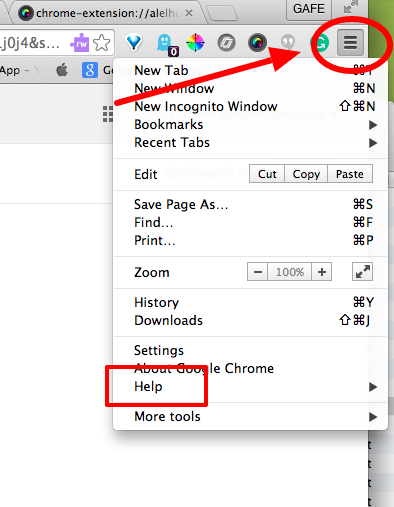 You can manage them (turn them on and off) by going to your Chrome hotdog icon and choosing "more tools". I've created a Google sheet of apps and extension. Please add to this list when you find something you like. As the list grows, I will divide the list into tabs. Enter only the information you think is needed. I've added a few of my favourites. Once active, you will notice the mic will turn red while "Listening..." will display. Speak into your mic and let Google do its magic. A tool that I think is most important is the "Reading Level" tool. 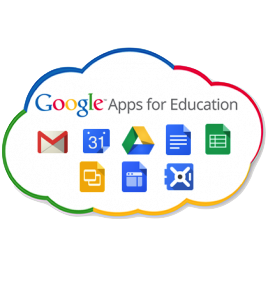 So as we embark on this exciting move to Google Apps for Education (GAFE), I would like to say how happy I am about the response we have had. Though it may seem we will need to learn a whole new set of skills, really we are moving to a platform that will make so many things so much easier for so many of us and our learners. Some things will need a little adjustment time but for the most part I think the transition will be a smooth one. Remember, Microsoft Office is still available whenever needed, but do try out the different tools available even before training begins. So it's time we revisit Twitter. Included are schedules for on-line Twitter chats where teachers meet up regularly to have moderated discussions. To get you started Edudemic has posted a Teachers' Guide to Twitter and Twitter 101 for Teachers, and because we all learn differently here is a slideshare on Twitter for Teachers. If you are looking for people to follow, TeachThought (follow them!) 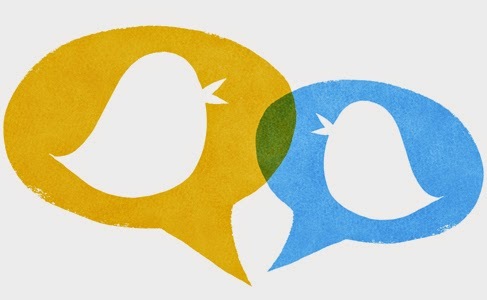 has put out this list to get you started: 10 Educators On Twitter You Should Follow (But Probably Don’t), and here's a great list from Mashable: 10 Rockstar Teachers on Twitter. And finally, for those of you who might want to start a class Twitter, here's Twitter support on how to have people follow you even if they don't have a Twitter account. The Shortcode you will need for Canada is 21212. So I'm driving in my car one Saturday afternoon, and I'm listening to NPR. TED Radio Hour, RadioLab, and Spark are on one after another...what luck! Even though I am driving from one listening zone to another, I use the NPR app on my phone and plug it into my car radio (now if they would only invent PVR for radio –– would that be PAR?) and I can have uninterrupted listening for as long as my phone battery lasts. The subject is Learning and Remembering...on one of the shows, can't remember which and my favourite story is about a young science grad who wants to go to medical school. He comes from small town USA and when he gets to Big University Medical School (I don't remember where he got in) he realizes he's ill-prepared for the work load. One month in he has his first test. He studies night and day and feels there is no way he can flub this test. Wrong. As soon as he begins, he realizes his recall just isn't working. He gets a 65. He is not willing to give up his dream of being a doctor, but he knows he can not work any harder. He studied as hard as he could. It becomes clear he has to study better. This is when he discovers Dr. Bjork's research at the Learning and Forgetting Lab at UCLA. What he finds out is that reading notes over and over again will help you remember some of what you read, but not for very long. For the truly deeper learning, your brain has to be asked to recall the newly acquired information over and over again. The more time you ask your brain to recall the new information, the better, and the different applications (like real world connections) you use, even better. So our young med student creates quizzes for himself...he asks fellow students to quiz him (Hello Socrates!) He also learns from Bjork's research that mixing data up or "Interleaving" works best. So rather than "blocking" information to study, mixing things up with previous learned data, or completely different subjects will result in better great recall. All this leads to the presentations I made to both our ES and HS faculties. Quizzing. I am not talking about "testing" but maybe I'm splitting hairs. We can test for many things...checking in for understanding, for prior knowledge, exit tickets, formative assessment –– not every quiz need generate a mark. Tests, Dr. Bjork tells us, can also provide an opportunity for learning. One last thought, testing just to assess knowledge can create fear. We know our prefrontal cortex will shut down when threatened so we need to take the fear out of quizzes. Let's make them fun. Hmm, great name, huh? This a an online tool that lets you shoot a quiz, exit ticket, discussion prompt and more to your students either through their website or to a mobile app. Imagine your students solving a quadratic equation on the bus/car ride home. What's great about Socrative is how spontaneous you can be. Kids don't need to create accounts, so accessing the quiz couldn't be easier. Once your students have answered, an excel spreadsheet report is made for you to download. If you've used other online survey tools, like Survey Monkey, you'll be comfortable with Google Forms. 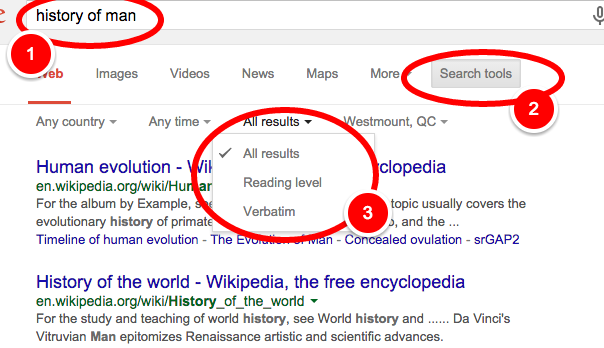 You can create questions with multiple choice, text, or paragraph answers. Images and videos can be inserted as well, so if you've been flipping your classroom, or you need to differentiate, you're all set. 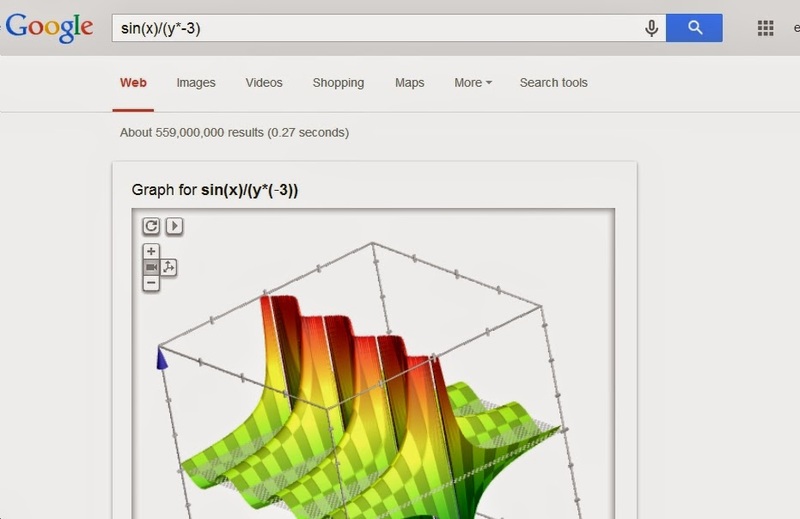 An option to view a summary of the results gives you graphs that help you analyze the data yourself or share with your students. Flubaroo is a google sheet add-on that will mark your quizzes for you. 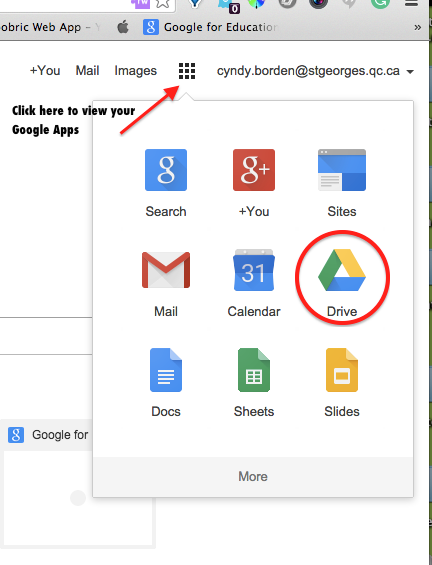 This works great with Google Forms and is not complicated to use. At a glance you can see which questions cause the most trouble, and which students are having the most difficulty.